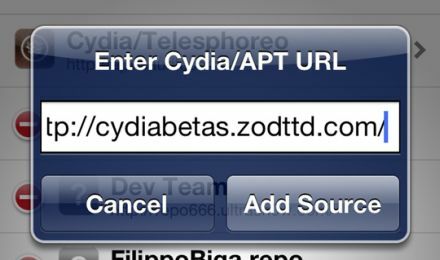 ZodTTD is among the default Cydia sources that come along with Cydia when you download it. After jailbreaking your iOS device may it be iPhone, iPad or iPod touch once you install Cydia on it some Cydia sources are added by default to your Cydia app. One among them is ZodTTD. Some other default repo are ModMyi, Dev Team, BigBoss and MacCiti. Even if you delete ZodTTD repo from Cydia it will work fine. You will able to download cracked apps, themes, wallpapers, games, mods, unlocks, free apps, DLC's, notification bars etc. But you will miss some of the quality apps and tweaks that are hosted on ZodTTD. On the other side if you add ZodTTD repo to Cydia you will be able to download apps to customize slide to unlock text. popular cydia lockscreen tweaks, best dreamboard themes and much more fancy stuff. Hence, if you have accidentally deleted this repo or you if this repo is not currently added to your iPhone then you can add it right now and avail all the benefits it provides. Here I am sharing some steps to add ZodTTD repo to Cydia. But before moving further lets discuss what's ZodTTD repo? ZodTTD is a quite "ancient" technology developer. It has been releasing games and apps even before app store was launched. ZodTTD used to release apps publicly through their source. ZodTTD provided video-game console emulators, games, and entertainment apps during the days of iPhoneOS 1.1. Earlier the only way to use any other company's app on iPhone was to jailbreak it. And since ZodTTD and a few other developers were releasing many cool games more and more people began jailbreaking their iPhones and iPods. Through its technical knowledge ZodTTD was serving popular Sony Playstation games and Pokemon on iphones and ipods. This was even before Apple had app store. Later ZodTTD hosted their own software repo and when Cydia was born ZodTTD repo was builtin. Also see - Best Cydia sources for iOS. Step 1 - Tap on Cydia icon on your homescreen and open it. 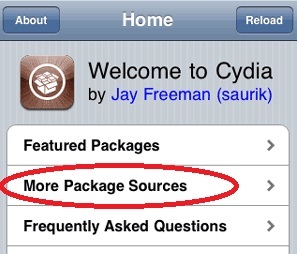 Step 2 - On Cydia homepage you will see three options "Featured Packages", "More Package Sources" and "Frequently Asked Questions". Tap on "More Package Sources". Step 3 - In the default sources you will see ModMyi repo, MacCiti repo, BigBoss repo and ZodTTD repo. Select the ZodTTD repo. Step 4 - A message box confirming to "Add Source" will appear. Tap on "Add" to continue. Step 1 - Tap on Cydia icon and open it. Step 2 - Go to "Manage" -> "Sources" -> "Edit" and then "Add" option. Step 4 - Tap on "Add Source" then on "Add Anyway". Finally "Return to Cydia". ZodTTD repo has now successfully added to Cydia. So these were some of the ways through which you can add ZodTTD repo to Cydia. Add this cydia source, download the stuff and delete it again if its not much in use. Also check out some other cool app providers like iFunbox, AppCake, AppAddict and vShare.